Commissioned by the European Saxophone Ensemble (ESE), Flocking III explores the mechanisms of the emergent system, in which multiple individual components express themselves as a single entity. Our planet offers many spectacular examples of this type of behaviour, among the most astonishing of which are flocking patterns of birds in flight. Of all birds in the Northern hemisphere, the starling flock is perhaps the most eye-catching, and it is also given the most beautiful of names – a murmuration. The largest recorded starling murmuration occurs annually in Rome and can number greater than 10 million individual birds, each with a reaction time as fast as 0.026 seconds. My work on the Flocking Series was informed by the research of computer scientist Dr. Pavlos Antoniou of the University of Cyprus and mathematical biologists Luke Coburn and Dr. Iain Couzin of CouzinLabs in Princeton University. 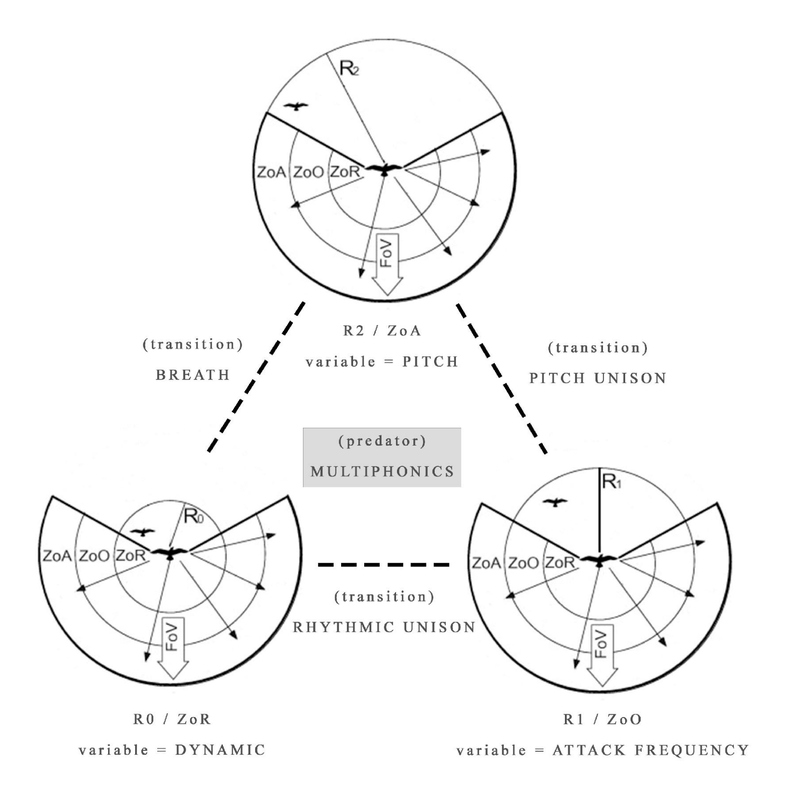 As source material for Flocking I-II, data derived from bird flocking simulators (or boids) and their x,y and z co-ordinates in space translated into musical values of pitch, attack frequency and dynamic. The streams of numbers yielded behavioural types that emulated the movements of birds in the air and in places the score itself bore resemblance to flock patterns and the motion of the wing. Flocking III uses an intuitive score type expressive of the observation that humans also self-organise through behavioural patterns and regularly participate in dynamic group situations. In fact we do this every day of our lives, whether walking through or standing in a crowd, or listening to and responding in the language of music. The grammatical structure of music is formed of basic variables, in a similar way to that in which a spoken language can be understood, and these emergent properties can be translated into action through improvisation. This process is actually very close to how we learn to play music in a large group. Performance of the piece requires each member of the ensemble to listen and react improvisationally to three variables in the music. These areas are defined as ZoR, ZoO and ZoA and correspond to the zones of Repulsion, Orientation and Attraction, which are used to translate the motions of flock mechanics into simulations. These areas govern the behaviour of the individual bird; when another bird moves into the zone of Repulsion the instinctual response is to move away, and similarly to align or move towards in the zones of Orientation and Attraction.